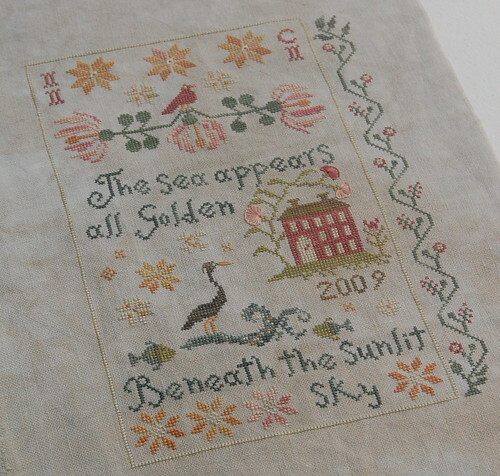 Nicole's Needlework: Beneath the Sunlit Sky Finished! Well, I'd better get back to my housework - lots of laundry to fold and bathrooms to clean (what's new?)! :) Write soon! absolutely stunning!! i really really like this one and am putting it on my list. Love love love this! Fantastic work. Wonderful finish! One of my favorites. Love the linen color too!! beautiful! i love the fabric you chose for this project. What a great finish. I love it. You are such a fast stitcher! Love this design! Beautiful finish! Gorgeous, do you sleep ;-)? This is WONDERFUL! SO summery and sea-swept! I'm in love! Wow! You blew through that one! Lovely. I am officially the only person never to have read DaVinci Code. Wow, your a fast stitcher! I love this design. Thanks for the inspiration. Just gorgeous!!! How do you finish in such a short time???? It's gorgeous, Nicole! I just love the colors so much! Gorgeous, Nicole! Congratulations! You really are one of the fastest stitchers I've ever seen. I am officially the only person never to have read DaVinci Code. It is gorgeous. I love the colors and how the fabric looks so gentle with the gentle looking colors. P.S. I haven't read the Da Vinci Code or Angels and Demons yet...lol. Woo Hoo, how lovely! The colors are just sooooo pretty! Hey, congratulations on your magnificent Beneath the Sunlit Sky! Gorgeous stitching! This is beautiful Nicole. Love the colors and fabric - it's so delicate looking. You got that one stitched fast! This is a really beautiful finish! That is gorgeous, Nicole. I love the colors! Beautiful, just as I knew it'd be!!! Oh so beautiful, Nicole and those button hole stitches are perfection! Great job!!! This piece is so beautiful with its subtle colours. Congratulations on finishing it. it is really very nice, I love it !! Just beautiful! You really are fast! Absolutely gorgeous, Nicole. 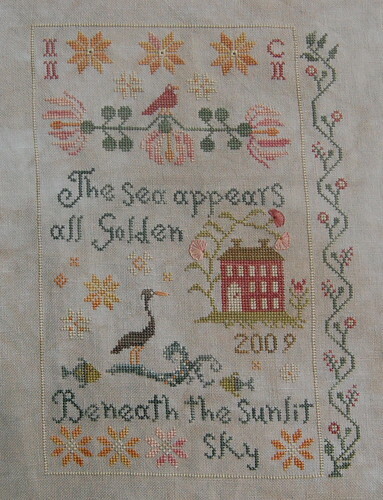 What lovely stitching, glorious colors, its really stunning. That is just stunning! Gorgeous stitching! Congrats on this beautiful finish! Lovely finish, love the colours. I haven't read the DaVinci Code either or seen the film. I love this design - espessially this flowers stitched with unusual stitches. Fantastic stitching again. Well done. Lovely finish Nicole - the colors are great. I love all your stitching and thanks for sharing with us. Nicole--came across your blog, and have been reading it for a while tonight! I am amazed at how many projects you have finished this year alone! And you do such lovely work! I added a couple of charts from your works to my wishlist! I think I will come back often, since you will actually have progress to post! This is soooooo gorgeous, Nicole!! A great finish, and such quick work! I love it!!! Nicole, I love your version of this lovely design. Congratulations on another stunning finish! Missed this post, but had to comment on how truly gorgeous it is!! Wow! Oh, I love this! So beautiful, Nicole. What beautiful work you do Nicole. I am so jealous of the way your needle flies!